Email is an important part of doing business. Many web hosting companies provide an email address to go along with your hosting plan. At first this might look like a good benefit because you can have everything in one place, but in reality it can do more harm than good. Using a 3rd party email hosting is a better option. How? Let’s look at some of the problems with email. If your email is tied to your DNS, when your host experiences downtime (and unless you have multiple servers to keep your site on the net you will experience downtime) you will lose access to both your site and your email. Having your email through a separate hosting service will help separate the servers so that when one goes down the other does not. Of course it’s possible for an email host to go down too, but at least it won’t go down just because the web host did. If your email server is shared with someone that’s known for sending spam, you might get blocked because you share the same server. This means you could end up on a black list and get your emails bounced. It can takes several days to get off of the blacklists. Dedicated email hosting services work hard to ensure you’re not spamming or blacklisted. The host’s server is already handling the web requests and the database. Often, email from shared hosting can get delayed. Some emails get dropped. Since the email hosting server doesn’t have to share bandwidth with websites your emails can land in inboxes faster. Since hosting providers focus mostly on hosting, most of their support staff is trained in the hosting side of things. Also, if it’s not a service that you’re paying for it might be difficult to get the host to make it a priority if your email goes down. Migrating your website to a new host is difficult enough, but when you also need to migrate email you’re just adding extra problems. If you decide to change hosting you have to change your email too unless your host provides email separately from hosting. If you do migrate to a new host then your email will be down during the DNS move. Your host might be exceptional of providing and supporting hosting plans for all of your website needs, but that isn’t enough to make them experts when it comes to email. Email that’s provided by your host usually has less features, such as an inbox of 100 MB, no calendar (unless you pay extra), and subpar spam filters and security. Using a 3rd party provider allows you to shop around for an email platform that works best for you. You can get the features and layout that you want. They can offer more features because it’s their expertise. There are lots of free online email services such as Gmail, Outlook, Yahoo, and others. Some include calendars, lots of storage, and other useful features. The services are free, but most use ads to support the service and they don’t provide support beyond the basics if any at all. It can be difficult to change your email from one provider to another. For example, if I used myemail@hotmail.com and I wanted to change to gmail, I would have to inform everyone that my email changed to myemail@gmail.com. There will always be people who didn’t notice the change and send correspondence to your old email address. It’s also possible that some of these providers can’t send email to all recipients because some may be blocked. Another problem is you’re not working under your own branded domain. Mysiteemail@gmail.com doesn’t look as professional as Myemail@mysite.com. Having your own domain helps you convey professionalism to your clients and customers. Your own domain is scalable where free accounts are not. Using your own domain will let you move from one provider to another and you get to keep the same name. 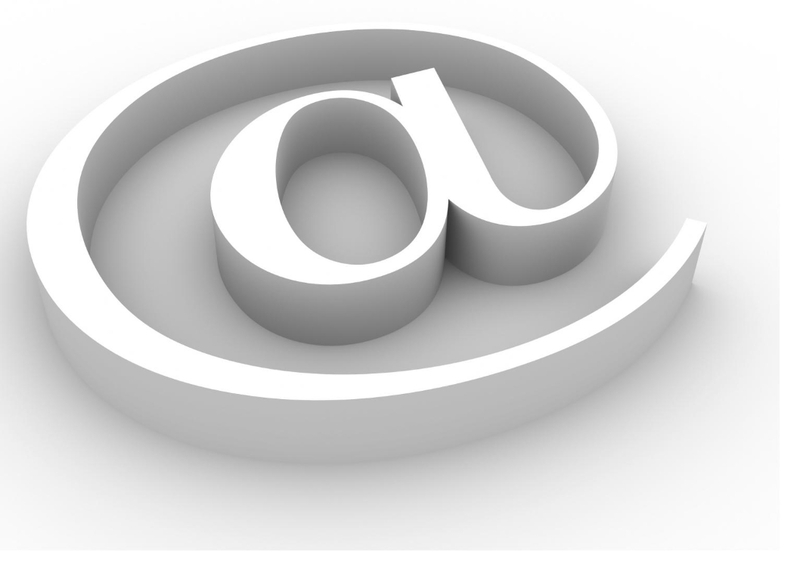 Here is a short list of recommended email hosting providers. 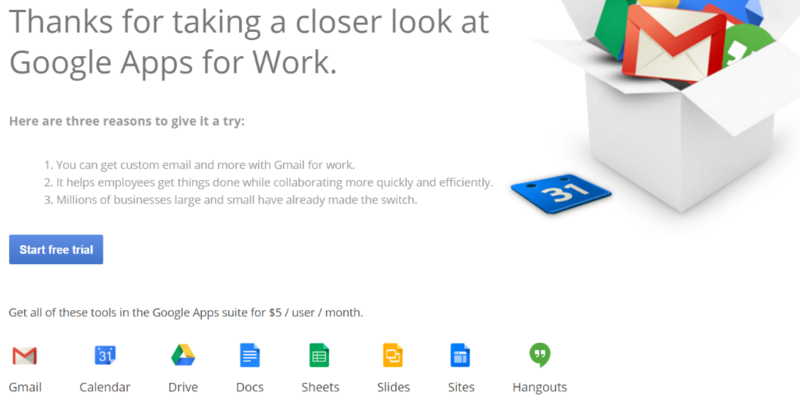 Google Apps for Work includes a business version of Gmail that includes 30GB of storage using Google Drive, spam protection, and offline support. It even has integrated video meetings, using Google Hangouts, so you can use it to communicate with your team and clients. The calendar can be used offline and has event reminders and invitations and can be shared which is great for collaboration. It includes Google Docs to create documents, Sheets to build spreadsheets, and Slides to build presentations. Sites lets you easily build an intranet project site. It’s ad-free Gmail with your own domain name, tech-support, and extra storage. An advantage to this one is users might already be using Gmail anyway, so they’ll be able to use this without a learning curve. The entire suite is $5 per month per person. Aabaco from Yahoo! Provides an easy to use interface that’s completely ad-free. You can keep your email organized by dragging and dropping into folders. You can search your email by content, subject line, and attachments. It has spam and security protection to help protect your business data, guard you against phishing, and keeps spam out of your inbox. It allows for customized email addresses and includes a domain so your emails will look professional. 24-hour phone and email support is provided. The two plans include: Business Mail for $9.95 per month and includes unlimited email addresses and storage space. You can have a Custom Mailbox for $34.95 per month with unlimited storage. Network Solutions has accounts to match all needs from personal email all the way up to enterprise solutions. All levels include email that matches your domain name. It includes virus and spam protection. Prices start at $1.75 a month per mail box. The $4.99 package includes shared calendars and syncing. 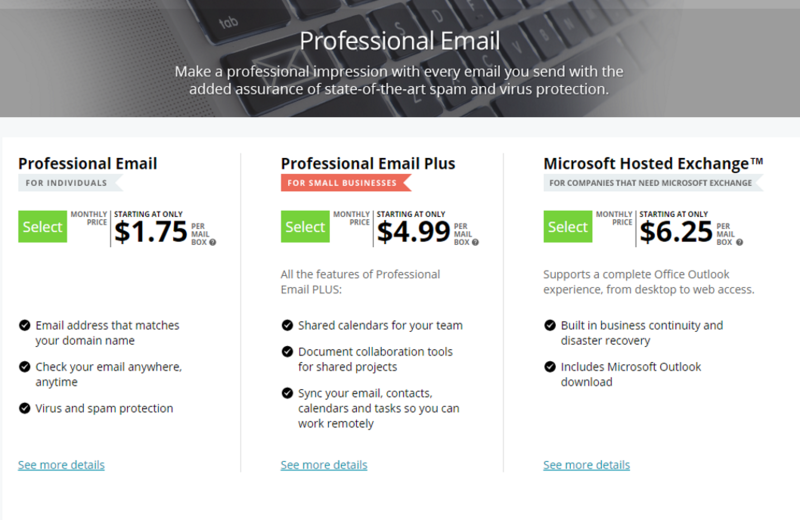 The $6.25 package includes disaster recovery and Outlook connectivity. Office 365 Email and Calendar provides a clean and professional interface and keeps your email, calendars, and contact information in sync between all of your devices. It’s a great choice for small business and enterprise-level email. It uses your own domain so your emails are linked to your brand. It includes 50 GB of storage per user and allows you to send large files of up to 150 MB. You can create custom scripts and even recover deleted accounts. It includes malware and spam protection. 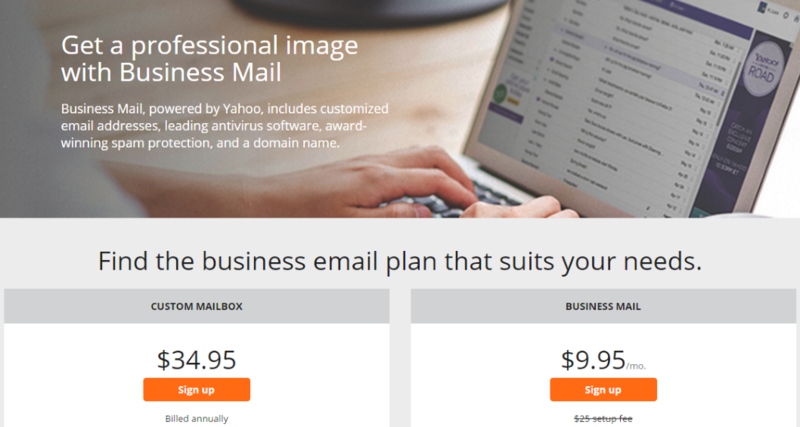 Prices for the stand-alone email service starts at $4 per month per user. It can be hosted through companies such as Rackspace and GoDaddy. When you consider how crucial email is to doing business, selecting who hosts your email and how it’s managed becomes a higher priority. 3rd party providers are accountable and responsible. They don’t treat your email like an add-on, after-thought, or secondary product. Your email is not affected by your server’s downtime and most provide backups. And best of all, you can choose the solution that’s right for you. Your turn. Do you use an email hosting provider? Do you have anything to add? Let us know about your experience and tips in the comments. I’ve been using Office 365 for several years now and enjoy their reliability, attractive web interface, storage and web apps if I’m not at my home computer. I feel great about the malware protection it offers if I open an infected file (it’s supposed to strip it out). Thanks for the article. With all the hosting providers having Denial of service attacks and being off-line from time to time, I’m glad my email is still being delivered. Probably most people don’t think about that – I know I didn’t in the past. For some emails the need was to be able to garantee a minimum of daily emails (I choose via this link http://docs.mailpoet.com/article/49-lists-of-hosts-and-their-sending-limits ) for other was the ability to customize the spam filters.